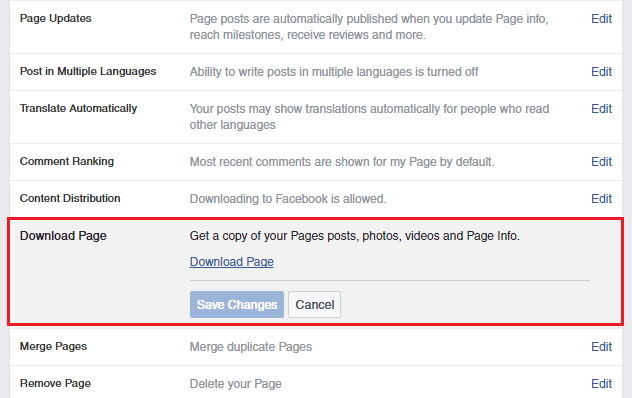 You can request to download a copy of your Facebook page through Facebook page settings. This copy will contain posts/photos/videos shared on the page by people who work on the page, a list of people who have roles on the page, a description of the page's current settings, page info from the about section. 1. Go to "Settings" → "General" of your Facebook Page. 2. Click on "Download Page" setting. 3. Now click on "Download Page" link. 4. You will see below page. Click on "Get Started" button. 5. Now Press "Start Downloading" button. You will this message from Facebook. 6. Wait until you receive an email from Facebook. 7. Now visit the "Download Page" section again clicking on the link of the email provided by Facebook. 8. Press "Download Page" button. Your password will be asked by Facebook. After that you can download your copy of the Facebook page.